I'm heading off to Amana for Handworks in a few days and preparing like mad. A trip to Handworks reminds me once again that point of all of this iron-mongering is to enable people to make stuff. These days our basic furniture needs are met very economically by factories so if you are making furniture the reason is usually a personal challenge, a desire to work with one's hands, and a desire to push the envelope of what can be made with wood. Two recent exhibits bring the idea of pushing the envelope clearly in focus. This blog is about a carver pushing the envelope. A few months ago I was planning to take a Wednesday off to see the Roentgens exhibit at the met before it closed. As it happened I got an email from a Randy Beranek, who reads my blog, about a week long exhibit of work by carver David Esterly which was at the W. M. Brady Gallery on 80th Street down the block from the Met. 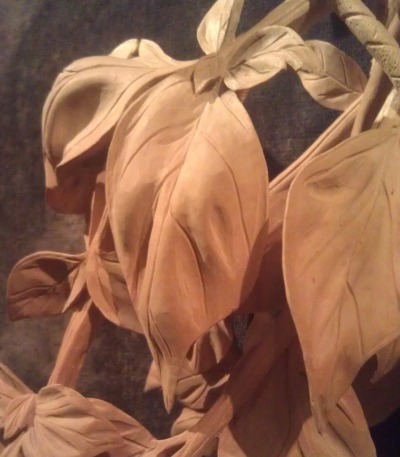 I had seen pictures David's work many times in Woodcarving Magazine so naturally I jumped at the chance. My friend Jeff Peachey and I were scheduled to have lunch that day at Mile End and he had just finished reading David's new book so he wanted to come too. The exhibit was carefully and leisurely laid out in several rooms so that you can enjoy the pieces without distraction. The pictures I have seen of David's work just don't do his work justice. 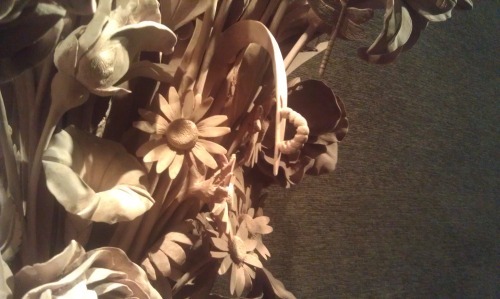 The carvings are generally bigger than what I expected and all the carvings have a sense of hyper realism. It's not a real bouquet of flowers, it is a perfect bouquet of flowers. 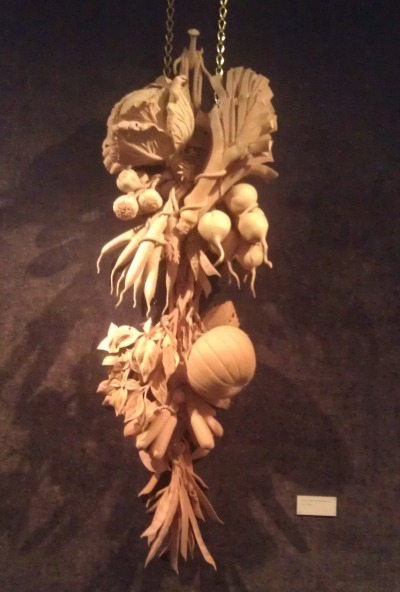 In his sculpture of vegetables, the arrangement of everything is perfect. Even imperfections like a caterpillar eating a leaf is done elegantly. By coincidence the artist himself happened to be in the gallery when we visited, so chatted about this and that. 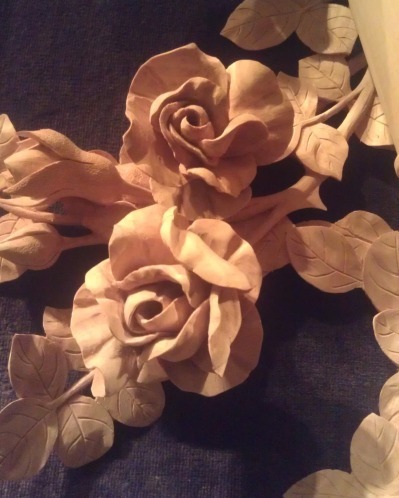 I asked David if he worked from actual flowers, fruits, and if he mocked up the pieces before he actually carved them. He doesn't. He draws them in illustrator and once he is happy with his design he goes from the drawings directly to carving wood. Not being constrained by the reality of a mock-up, David has the freedom to do with carving what artist can do with drawings. He is freed from the physical constraints of how actual reality looks like. His approach to realism is also very much grounded in the physical limitations of the detail limewood (which is what he primarily carves) can take and the sense of what detail we can see. The gallery hung the pieces at normal "gallery height" but most of David's work was borrowed for this exhibition from various private collections and many of the works are designed to mounted higher on a wall and viewed from below. In general the detail of a lot of the pieces are meant to be absorbed from a few feet away, not examined under a magnifying glass. 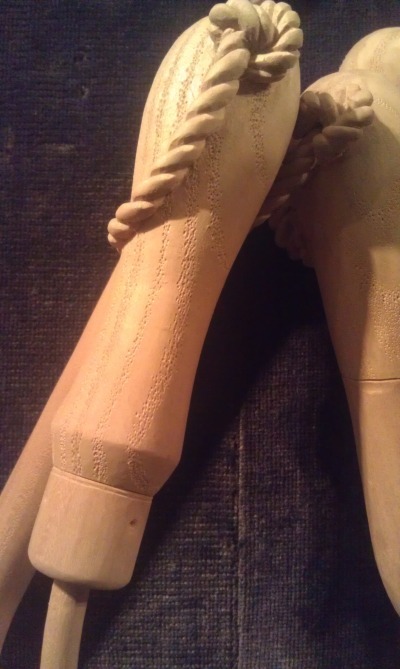 There are a few carved carving tools mounted in a few pieces which have handles that are stippled to emulate ash. It's a very convincing look, and from a few feet away the tool handles all look like ash. 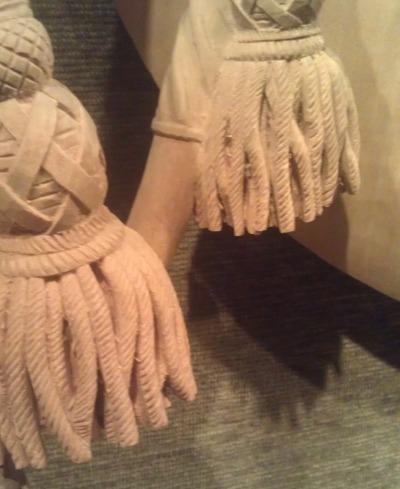 The carved drapery of one piece has that fuzziness to it that you get on fabric. But the leaves are mostly plain with very few if any veins or texture to them. I think this is because from a few feet away you would not really seem them, and what you register is the leafiness of them and the delicacy of plain flower petals. Fabric and tools have the detailing of texture so we register it as fabric. This approach to carving in itself is very interesting. One of the absolute benchmarks of modern sculpture is that it isn't realistic at all. And of course at first glance at Esterly's works it is realistic and can be easily dismissed by a lot of modern art critics as "craft" rather than "art". And then of course there is the school of criticism that dismisses this type of work as "decorative art". And of course in the modern world of art schools by and large craft isn't taught which immediately puts this sort of work as "outsider art" even if most of the time that term is used to describe more primitive works. It's pretty obvious and I think we can all agree that the level of carving skill needed to create these works is pretty high and I think lots of people get blinded by the level of craft and miss the art. You see my reaction and I think the reaction of just everyone who sees David's pieces for the first time is "OMG how amazing is that". it's the same feeling you get when you look at the ceiling of the Sistine Chapel, or some finely engraved suit of armor at the MET. It's easy to be blindsided by the craft and miss the art. And of course we are only seeing the pieces for a few minutes in a gallery. David's work is almost all created for residences where the homeowners live day in and day out with the pieces. I think after living with these pieces for a little while, after the amazement about the craft of the pieces wears off, that the art will sink in and work will be enjoyed even more. I'll write about the Met exhibit I saw later that day, "Extravagant Inventions: The Princely Furniture of the Roentgens", another time. 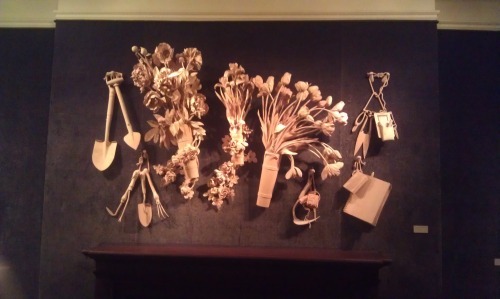 Mr. Esterly's work demonstrates his mastery of both "ART" and "Craftsmanship". I believe that those who can not see this have neither the skill of the Artist nor the Craftsman, thus no ability to understand. There are many excellent craftsman that can implement/copy some image of a piece of art, but could never create the art itself. However, the true artist must master the craft of his/her media before the art can be shared. I am still working hard to master the craft of woodworking and have some hope, but can only dream of have the skill of an artist. My hat is off to all of the Mr. Esterly's in the world who are truly an artist with the talent to convey that art in such a difficult media as wood. Joel: thanks for the write-up about Esterly's work. I read the book and it was a highlight of the year. In addition to being a great story, it was so well written, I hated for it to end. Lucky you to have seen the exhibit & bumped into D.E. himself. Good luck in Iowa.